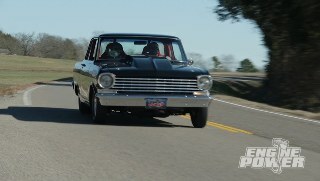 Mike and Pat modernize a mid 90's themed Pro Street '62 Chevy II Nova. Tear down, planning and prep will complete the first portion of this build…. Mike, Pat and several local gearheads eat barbecue and go head to head for the first annual BBQ And Burnouts special. CAPSULE, HERE'S A LOOK AT OUR PROGRESS SO FAR. MOUNTS TO KEEP IT IN PLACE. THEN HEADERS WERE MODIFIED AND THE TURBO WAS MOUNTED SO WE COULD GET AN IDEA ON ROUTING OPTIONS FOR THE PIPING. (PAT)>> THAT IS A NICE JOB RIGHT THERE! BEFORE ANY ASSEMBLY HAPPENS THE CAR WAS BROUGHT HERE TO COFFEY FABRICATION AND RACE PREP IN NASHVILLE, TENNESSEE. (MIKE)>> THIS IS WHERE AWESOME PROJECTS ARE DESIGNED AND CONSTRUCTED. NOW THEY HAVE BUILT MACHINES FOR THE DRAG STRIP, THE SALT FLATS, AND EVEN THE STREET NO MATTER THE BRAND. TO A RADICAL BUT STILL STREET DRIVEN RACE CAR. CHRIS COFFEY IS THE MAN BEHIND THE NAME. HE'S A TOP NOTCH FABRICATOR AND CHASSIS TUNER. HE'S THE ONE WHO MASTER MINDED THE TYPE OF SUSPENSION, THE MEASUREMENTS, AND THE PART SELECTION. (CHRIS)>> I TALKED WITH CHRIS AT CHRIS ALSTON CHASSIS WORKS, AND BASED ON WHAT YOU WANTED OUT OF THE CAR WE CAME UP WITH A GOOD LIST OF PARTS TO PUT THE WHOLE SETUP TOGETHER, AND MAKE IT EXACTLY WHAT YOU WANTED. THIS TYPE OF SUSPENSION FOR A LIVE AXLE IS ABOUT AS GOOD AS IT'S GONNA GET. YOU HAVE A WATTS LINK SETUP AND COIL OVERS. (PAT)>> NEXT TIME WE SEE IT WE'RE PICKING IT UP AND FINAL ASSEMBLY HAPPENS. AARMS, ALL UNDER THE WATCHFUL EYE OF CHRIS COFFEY. (CHRIS)>> TODAY WITH THE GALAXY WE WERE SPENDING A LOT OF TIME MEASURING AND MAKING CUTS, AND SLOWLY WORKING UP TO HAVING THE COMPONENTS EXACTLY WHERE WE WANT THEM. (PAT)>> HE CHOSE CODY BONNETTE TO TAKE THE LEAD, NOT JUST BECAUSE OF HIS SKILLS, BUT ALSO BECAUSE OF HIS PASSION. TIME AND KIND OF BECOME DESENSITIZED. SO RIGHT WHENEVER I SAW THAT CAR I WAS JUST LIKE, WOW, I WOULD LOVE TO WORK ON THAT. AND HOW BIG IS THE TUBE? (CHRIS)>> IT'S INCH AND FIVEEIGHTS. CODY'S A FRIEND OF MINE WHO'S BEEN HELPING ME OUT FOR ABOUT A YEAR OR SO NOW. HE REALLY JUST STARTED COMING IN ONCE A WEEK MAYBE AND DOING SOME WELDING WHEN I NEEDED SOME HELP. HE'S A PROPERLY TRAINED TIG WELDER. HE DID OIL FIELD EQUIPMENT AND STUFF LIKE THAT, AND HE'S AS GOOD AS YOU GET WITH A TIG TORCH, AND HE'S LEARNING AS WELL, AND HE'S A GREAT FABRICATOR. THIS LINE, AND LAND HERE, AND BE CUT THE PERFECT LENGTH SO THAT IT FITS JUST RIGHT AND YOU'RE NOT HAVING TO FILL TOO MUCH OF A GAP WITH WELD, AND THAT WAS, IT'S JUST SO IMPORTANT TO HIT THE TARGET. SOMETIMES IT'S A VERY NARROW TARGET BECAUSE PEOPLE'S LIVES REALLY DEPEND ON IT IN THIS CASE. (PAT)>> IT'S THAT DEDICATION THAT BRINGS US BACK TO COFFEY'S. THE CHASSIS ON THIS PROJECT IS 53 YEARS OLD, STILL SOLID, BUT NOT ENOUGH TO HANDLE THE TURBOCHARGED 347 WE JUST DROPPED IN IT, WHICH IS PRODUCING AT LEAST FOUR TIMES THE HORSEPOWER AND TORQUE THAN THE STOCK 260 FROM THE FACTORY. THE ADDITIONAL STRESS AND TREMENDOUS AMOUNT OF GFORCES THESE MOUNTS WILL NOW ENCOUNTER REQUIRE THEM TO BE EXTREMELY DURABLE. A LOT OF TIME IS SPENT ON FINDING THE EXACT LOCATION AND ANGLES TO MOUNT SOLIDLY TO THE FRAME. EVERYTHING COMPLETELY. THE GALAXIE, IT'S GONNA BE A REALLY COOL CAR. UNIQUE FOR SURE, POWERFUL, FAST, SHOULD BE GLUED TO THE GROUND PRETTY WELL TOO WITH ALL THE SUSPENSION WORK WE'RE DOING. WATTS LINK AND TORQUE ARM IN THE BACK, AND COIL OVERS UP FRONT, AND REALLY BIG BRAKES ALL THE WAY AROUND, AND AS MUCH TIRE AS WE CAN GET UNDER IT, AND IT'S GONNA BE A NICE CAR. 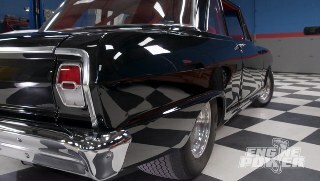 (MIKE)>> NOW IT'S TIME FOR US TO LET CHRIS AND CODY DO WHAT THEY DO BEST, FINISH UP THE FABRICATION ON THIS OLD GALAXIE. NOW NEXT TIME YOU SEE IT, IT'S GONNA BE BACK IN OUR SHOP, BUT DON'T WORRY. WE'RE GONNA PULL ALL THE SUSPENSION BACK APART SO YOU CAN SEE HOW IT WAS MADE AND HOW IT GOES BACK TOGETHER. 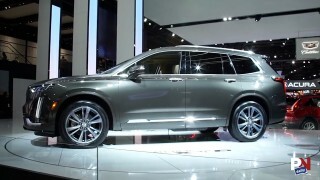 (PAT)>> IT'S REALLY GONNA UPDATE THIS CAR AND BRING IT INTO THE FUTURE. IT'S GONNA HANDLE LIKE NO OTHER GALAXIE I'VE EVER SEEN. (MIKE)>> EVERYTHING IS BACK AT THE SHOP, AND WE'RE READY FOR FINAL ASSEMBLY. WE'RE STARTING WITH THE REAR SUSPENSION. CHRIS ALSTON'S CHASSIS WORKS IS A LEADER IN SUSPENSION DESIGN AND MANUFACTURING. THIS IS THEIR UNIVERSAL FIT TORQUE ARM SYSTEM THAT POSITIONS THE CURRIE NINE INCH UNDER THE GALAXIE, AND CAN BE ADAPTED TO PRETTY MUCH ANY VEHICLE. TO ELIMINATE DELAYED RESISTANCE IN THE ANTIROLL SYSTEM A CHASSIS WORKS SPLINED IN TUBULAR ANTIROLL BAR IS INSTALLED ON THE HOUSING. IT'S A THREE QUARTER INCH ALLOY STEEL BENT TUBE DESIGN. NOW IT CLEARS FAB NINE AND OEM CENTER SECTIONS. BILLET PIVOT SOCKETS THREAD INTO THE LOWER BRACKET AND ALLOW THE BAR TO ROTATE SMOOTHLY IN A PLAY FREE JOINT. (PAT)>> THE TORQUE ARM COMPLETELY ELIMINATES AXLE WIND UP AND BUSHING DEFLECTION. IT GIVES THE VEHICLE INSTANT THROTTLE AND BREAKING RESPONSE. CHASSIS WORKS OFFERS THEM IN THREE DIFFERENT LENGTHS TO ACCOMMODATE DESIRED SUSPENSION GEOMETRY. (MIKE)>> FRESHLY PAINTED, DON'T DING IT UP. (PAT)>> I'M VERY CAREFUL, CAN'T YOU TELL. (MIKE)>> THE TORQUE ARM CROSS MEMBER IS WHAT THE FRONT OF THE TORQUE ARM ATTACHES TO. THIS ALSO PULLS DOUBLE DUTY AS THE TRANSMISSION CROSS MEMBER. ITS DESIGN AND MOUNTING POINTS ALSO WORK TO STIFFEN THE CAR'S FRAME. WITH THE REAR POSITIONED, THE CAR IS LOWERED DOWN. WE'LL START THE INSTALL BY LOCATING THE TUBULAR GLINK ARMS IN THE FRAME BRACKETS. THEY'RE ADJUSTABLE, EXTERNALLY GREASABLE, AND ARE THE ULTIMATE PERFORMANCE LINK FOR STREET AND TRACK DRIVEN APPLICATIONS. THE TORQUE ARM IS NOW CONNECTED TO THE THREE HOLE FROM MOUNT, WHICH PROVIDES ADDITIONAL PINION ANGLE ADJUSTMENTS. THESE LINKS CONNECT THE ANTIROLL BAR TO THE CHASSIS. (PAT)>> CHASSIS WORKS ALSO SUPPLIED THESE AWESOME VARISHOCK QUICK SET FOUR REMOTE RESERVOIR COIL OVERS. THEY ALLOW SEPARATE ADJUSTMENTS FOR BUMP AND REBOUND. EACH SHOCK HAS 16 DIFFERENT POSITIONS FOR REBOUND, AND THE SPRING/SHOCK COMBO GIVES US FIVE INCHES OF TRAVEL. AXLE FROM WRAPPING, BUT TO KEEP IT PERFECTLY CENTERED IN THE CAR DURING SUSPENSION TRAVEL WE'RE USING A WATTS LINK. THIS BILLET PIVOT ASSEMBLY IS ATTACHED TO THE REAR HOUSING. THEN 4130 TUBULAR STEEL LINKS ATTACH TO IT, AND MAKE THE FINAL CONNECTION TO THE LASER CUT FRAME BRACKETS THAT WERE WELDED IN AT COFFEY'S. THE SUPPLIED FASTENERS. SPACERS SLIDE ON, AND THE CALIPER IS LOCATED ON THE BRACKET STUDS AND TIGHTENED DOWN. STEEL BRAIDED BRAKE LINES FROM CROWN PERFORMANCE GO ON NEXT. A BRACKET AND CLAMP SUPPLIED BY BAER LOCATE IT ON THE HOUSING. UP FRONT IS THE SAME SETUP. THE SYSTEM IS DESIGNED TO WORK WITH THE GALAXIE SPINDLES, BUT WE DO HAVE TO ENLARGE A COUPLE OF HOLES TO ACCOMMODATE THE LARGER FASTENERS. THE SPINDLES ARE HARD, SO USE PLENTY OF LUBE WHEN DRILLING. NOW THE BASE BRACKET CAN BE INSTALLED WITH HALF INCH HARDWARE. THE INTERMEDIATE, OR CALIPER, BRACKET GOES ON NEXT. THIS HUB IS BILLET ALUMINUM AND COMES WITH PREPACKED SYNTHETIC GREASED BEARINGS. IT SLIDES ON THE SPINDLE. THEN THE CASTLE NUT IS INSTALLED AND TIGHTENED TO AROUND 10 POUND FEET. NOW LOOSEN THE NUT AND RETIGHTEN AS YOU TURN THE HUB. FINALLY THE COTTER PIN IS PUT IN PLACE AND THE SUPPLIED DUST COVER IS TIGHTENED DOWN. (MIKE)>> THE LAST COMPONENT IN THIS KILLER BRAKE SYSTEM IS BAER'S REMASTER BILLET ALUMINUM MASTER CYLINDER. IT'S A DIRECT REPLACEMENT AND AVAILABLE WITH A FORD, CHEVY, AND DODGE BOLT PATTERN. A 15/16THS, ONE INCH, AND INCH AND AN EIGHTH BORE SIZE IS AVAILABLE FOR THAT OPTIMUM BALANCE IN PRESSURE AND VOLUME. NOW MOUNTED TO THE BOTTOM IS AN OPTIONAL ADJUSTABLE PROPORTIONING VALVE. IT ATTACHES DIRECTLY TO THE FIREWALL. ARP BOLTS WILL SECURE IT. FILLER WITH A SCREW ON CAP FROM EARL'S PLUMBING. (PAT)>> COMPLIMENTING THE HOLLEY EFI SYSTEM WE'RE RUNNING ON THE CAR IS THEIR NEW VR ONE BRUSHLESS FUEL PUMP AND CONTROLLER. IT WILL WORK IN BOTH CARBURETED AND EFI APPLICATIONS, AND MUST BE USED WITH A RETURN STYLE REGULATOR. IT WILL SUPPORT UP TO 2,150 HORSEPOWER IN EFI APPLICATIONS, AND COMES WITH THIS TWO STEP CONTROLLER THAT WILL ALLOW THE FUEL PUMP TO RUN AT ONE OF TWO DIFFERENT SPEEDS. GO TO AN EARL'S YBLOCK. 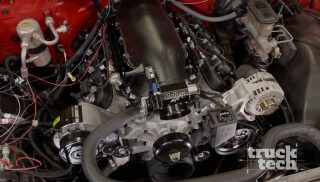 THE OUTLET IS DASH 10 AND GOES TO A HOLLEY BILLET ALUMINUM 100 MICRON PREPUMP FILTER. FROM IT THE DASH 10 LINE CONTINUES THROUGH THE FRAME RAIL. THIS PUMP CAN BE FULLY SUBMERGED IN A FUEL CELL OR CHASSIS MOUNTED LIKE THIS. NOW IT CAN MAINTAIN PRESSURES UP TO 130 PSI AND FLOW UP TO 335 GALLONS PER HOUR, MAKING IT GREAT FOR A FORCED INDUCTION SETUP LIKE OURS. THE CONTROLLER IS FULLY SEALED AND WILL MOUNT CLOSE TO THE PUMP. FROM THE PUMP THIS LINE RUNS TO A 10 MICRON POST FILTER, AND THIS LINE RUNS UP TO THE ENGINE BAY. WE'LL BE RIGHT BACK. (MIKE)>> WE'RE BACK AND CONTINUING ON WITH THE FUEL SYSTEM. NOW TO REGULATE THE FUEL PRESSURE WE'RE USING ONE OF HOLLEY'S BRAND NEW VR SERIES FUEL PRESSURE REGULATORS. NOW THESE ARE DESIGNED TO BE RAN WITH THEIR NEW BRUSHLESS SERIES PUMPS. THEY'RE AVAILABLE IN CARBURETED AND EFI APPLICATIONS. NOW FOR EFI THEY'RE ADJUSTABLE FROM 40 ALL THE WAY UP TO 100 PSI. NOW THEY'RE MADE OUT OF 60-61 TSIX BILLET ALUMINUM AND AVAILABLE IN TWO AND FOUR PORT CONFIGURATIONS. HOLLEY SAYS THEY'LL SUPPORT UP TO 3,000 HORSEPOWER. I'M MOUNTING IT ON THE FIREWALL CLOSE TO THE FUEL RAILS SO WE CAN MAKE SHORT RUNS WITH THE LINES. THE FEED LINE GOES DIRECTLY TO THE FUEL RAIL SO THE INJECTORS RECEIVE FULL PUMP PRESSURE AND NOT REGULATED. NOW A LINE COMES OFF THE OTHER RAIL AND GOES TO THE REGULATOR. TRY TO REGULATE PRESSURE AFTER THE RAILS ANY TIME YOU CAN. FINALLY A RETURN LINE IS RAN FROM THE REGULATOR ALL THE WAY BACK TO THE TANK. (PAT)>> WITH OUR FUEL CELL IN AND MOUNTED SOLID IT'S TIME TO PUT IN OUR SEALED BATTERY BOX KIT FROM SUMMIT RACING. IT COMES WITH ALL THE MOUNTING HARDWARE AND CABLING TO PUT IT ANYWHERE YOU WANT IN THE VEHICLE, AND FOR WEIGHT TRANSFER PURPOSES WE'RE PUTTING IT IN THE PASSENGER SIDE REAR. I PREDRILLED THE HOLES AND DROPPED IN THE STUDS. AN OPTIMA RED TOP AGM BATTERY WILL GO IN FOR TROUBLE FREE SERVICE. ALONG WITH THE SUSPENSION WORK, ANOTHER BIG UNDERTAKING TOOK PLACE INSIDE THE CAR HERE WHEN IT WAS AT COFFEY'S, AND THIS IS WHAT LED UP TO IT. THE MAGNUM TRANSMISSION IS MUCH LARGER THAN THE OLD TOP LOADER THAT WAS IN THE CAR. DURING MOCK UP WE REALIZED THE TUNNEL NEEDED SOME MODIFICATIONS. SO SEVERAL MEASUREMENTS WERE TAKEN TO GET AN IDEA OF WHERE THE CLEARANCE NEEDED TO BE. THAT WAS PRECISELY SHAPED ON A PRESS BREAK. THIS PROCESS AND MATERIAL CHOICE MAKE THIS STRONGER THAN THE ORIGINAL. TO GO THROUGH THE GEARS AMERICAN POWERTRAIN SENT US THIS MULTI POSITION ADAPTER SO THE SHIFTER HANDLE CAN BE POSITIONED WHERE THE DRIVER IS MOST COMFORTABLE. THEIR 10 INCH POLISHED STAINLESS STEEL SHIFTER HANDLE REMINDS US OF THE ONES IN THE OLD NASCAR RACE CARS OF YESTERYEAR. TOPPING IT ALL OFF IS AMERICAN POWERTRAIN'S SIGNATURE SHIFT KNOB WITH THE SHIFT PATTERN OF THIS BEEFY MAGNUM. ADVANCE THE GALAXIE ANY FARTHER TODAY. NOW WE MADE GREAT PROGRESS BY GETTING ALL THE SUSPENSION BOLTED UP, AS WELL AS THOSE MASSIVE BAER BRAKES INSTALLED. PLUS SEVERAL OTHER ODDS AND ENDS LIKE THE BATTERY BOX, SHIFTER, AND FUEL SYSTEM ALL COMPLETED. HANDLING GALAXIES ON THE PLANET. (MIKE)>> THE HIGH PERFORMANCE AFTERMARKET WORLD HAS ALMOST UNLIMITED AMOUNTS OF GO FAST PARTS FOR YOUR ENGINE PROJECT, NO MATTER THE BRAND YOU FAVOR. NOW THIS TECH TIP IS GONNA GO OVER THE BASIC GUIDELINES FOR CHOOSING THE CORRECT SIZE CYLINDER HEAD FOR YOUR APPLICATION. NOW WE GET A LOT OF QUESTIONS ABOUT THIS, SO LET'S GET RIGHT TO IT. (PAT)>> BACK IN THE DAY THE ONLY WAY TO GET A GOOD FLOWING CYLINDER HEAD FOR YOUR RACE OR STREET BULLET WAS THE HAVE IT HAND PORTED AT A PROFESSIONAL SHOP, AND THAT WAS COSTLY IN BOTH TIME AND MONEY, BUT WITH FIVE AXIS CNC PORTING EQUIPMENT BEING THE NEW INDUSTRY STANDARD, GREAT FLOWING CYLINDER HEADS ARE CRANKED OUT MORE RAPIDLY AND ACCURATELY THAN EVER BEFORE. (MIKE)>> WHEN WE REFER TO THE SIZING OF THE HEAD, WHAT WE'RE TALKING ABOUT IS THE VOLUME OF THE INTAKE AND THE EXHAUST PORTS, AND THAT IS EXPRESSED IN CC'S. NOW IT'S A PHYSICAL MEASUREMENT OF THE ACTUAL PORT SIZE. ALSO TAKEN INTO CONSIDERATION ARE THE VALVE SIZES, AS WELL AS THE COMBUSTION CHAMBER VOLUME. NOW THESE ALL DIRECTLY EFFECT THE OUTPUT OF THE ENGINE. AND EVERYTHING FINELY TUNED. 230cc TO 280cc ON ENGINES UP TO 470 CUBIC INCHES. NOW THAT COULD ACTUALLY BE LARGER IF IT HAS A HIGHER OPERATING RANGE. ON THE BIG BLOCK SIDE, 360cc TO 470cc ON ENGINES UP TO 650 CUBIC INCHES OR LARGER, AND THAT'S THE EXTREME SIDE OF THE SCALE. NOW KEEP IN MIND, RACE ENGINE'S PORT SIZING IS COMPLETELY DEPENDENT ON ITS RPM RANGE AND ITS APPLICATION, AND THAT DOESN'T TAKE INTO ACCOUNT ANY FLOW NUMBERS, WHICH IS A COMPLETELY DIFFERENT ANIMAL THAT WE'LL GET INTO AT A DIFFERENT TIME.